Our rider review process and Kickstarter campaign is part of our design finalization phase. We have already learned much via this on-going process. Here is a list of modifications that will be included in the first production run. 1. On both the large and medium/small FenderBag, the fender will lose the arch trajectory and straighten, approximately 3 - 4 inches from the end of the fender. We have been seeing and hearing about how the fender slaps the rear tire when the suspension activates and droops to much when the bag is stuffed. This is especially a problem with the smaller frame sizes. Straightening the fender out towards the end will eliminate much of that problem. However, we do realize that on the smallest frame sizes, the FenderBag is still a tough fit. We are going to be introducing another model that will fit these smaller frames. 2. 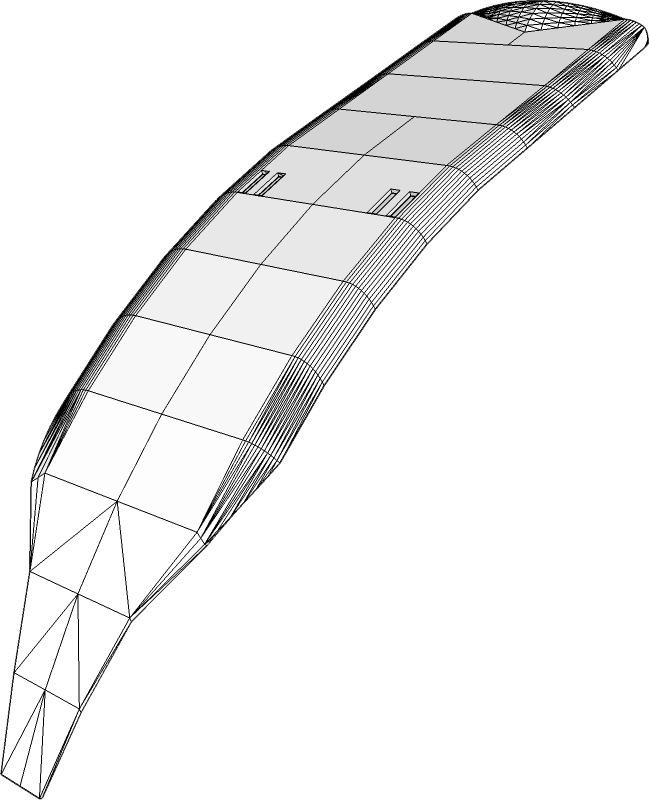 The tail of the fender will have an increased flare. The tail will turn up and flare in a moderate way. This will eliminate the possibility of the rear tire from possibly catching on the fender. So far this has not been a problem but to avoid any possible issue the tail will be flared. 3. The zipper direction will be reversed and a tougher zipper will be used. Several people have commented on the direction of the zipper. Noting that it is difficult to access when the open/close end is at the seat tube end. The zipper will be reversed for easier functionality. These prototypes have been constructed with a minimalistic zipper. The actual FenderBags will have a much more substantial zipper. Plus a pull tab will be included. 4. 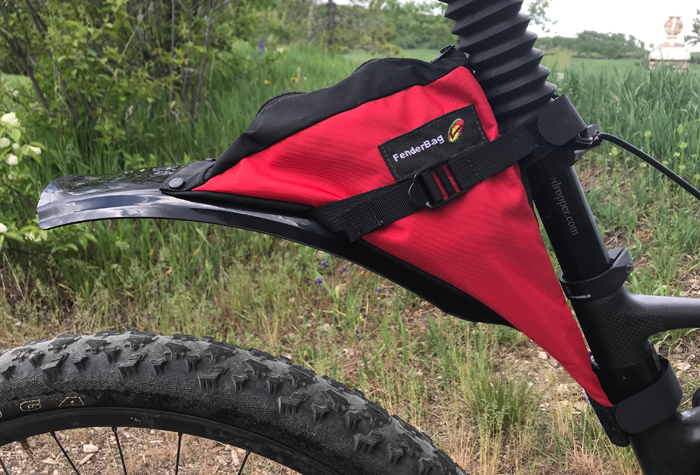 Compression straps have been added to all of the large FenderBag prototypes. We have discovered that if the large FB is not stuffed to capacity, it giggles around too much. By adding the compression straps, the FB can be made to have a snug fit; eliminating any unnecessary moving around. We have not made the decision to include this on the medium/small FB as the capacity on this FB is easily taken up; however, this could still happen or at least be a feature on some. As this feature will help fit the smaller frame sizes. Jeremiah, one of the review riders, pointed out that using a locking type clip for the compression strap would be best. He experienced the straps loosening up while riding rough terrain. 5. The velcro straps used to attach the FenderBag will be modified. 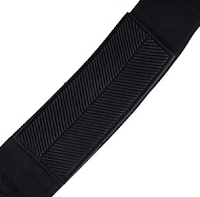 Both upper and lower strap will be removable and be interchangeable with a "long" or "short" strap. The long strap lengthened will be 2.5" longer then the short strap. This is a necessary improvement due to many of the modern mountain bike frames have oversized tubing and joints just below the seat collar. This additional length allows for better attachment. Additionally, the first 3" of both the top and bottom strap will have a gripper surface just like the frame straps we are offering. However, using the silicone adhesive is still part of keeping the FB securely attached and protects the frame from scuffs. The strap width is increasing up to 1 1/8". Providing more grip strength. 6. In order to accommodate the smaller frame sizes. We are going to introduce one more FenderBag style. It will also be much more racer friendly, with a smaller capacity and very light weight. At this time we only have very primitive prototypes. Once the initial two style are out we will introduce this third style.